Japanese car giant Toyota has given two of its most popular models - the Rav4 medium-sized sports utility vehicle (SUV) and the small Yaris - a facelift ahead of their appearance at the Geneva motor show. Alongside the two revamped vehicles, showgoers will also get a glimpse of the Urban Cruiser concept car, a crossover that is slightly smaller than the Rav4 and that combines SUV features with car-like handling. The new-look models are sparking expectations that the Japanese car maker's sales in Europe will top a million this year. Last year, the automotive group sold 964,000 Toyota and Lexus in Europe, says Thierry Dombreval, chief operating officer of Toyota Motor Marketing Europe, "and we built the vast majority of those cars here". 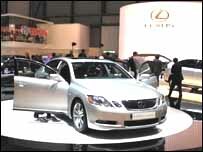 Analysts believe local production helps boost the car maker's profits. "Toyota's expansion of its global production network in Europe, North America, Asia and elsewhere is beginning to produce results, and we anticipate considerable earnings contributions in the coming years," says Nikko Citigroup analyst Noriyuki Matsushima. Toyota sales in Europe have already risen nine years in a row, points out Mr Dombreval, taking its market share to 5.1% of the European market. "Fundamentally, there's nothing negative you can point to with Toyota," observes Koichi Ogawa, chief portfolio manager at Daiwa SB Investments. However, it has not all been plain sailing. In January, when Toyota was named "America's best-selling brand", its European performance was left wanting. 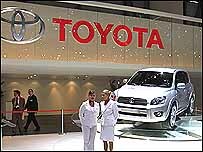 Toyota brand sales fell more than 10% in Europe that month, according to Brussels-based industry watchers ACEA. Similarly, Toyota's luxury subsidiary Lexus remains unpopular in Europe, despite its pole position in the luxury segment in the US. But a pair of Lexus models on display in Geneva could go a long way to correct that. The Lexus GS450h is the first luxury saloon equipped with a hybrid petrol-electric engine to hit the market, an example of Toyota's technological hegemony in this area. "Not only do we consider Toyota highly cost-competitive in established areas, we believe it has also a strong lead over competitors in commercialising new technologies," says Mr Matsushima. Lexus also made a splash with the LS460 luxury saloon, which should pose a more serious threat to top models from German car makers BMW, Mercedes and Audi than any other Lexus before it. Investors too have high hopes for the future. In North America in particular, Toyota Motor made a splash last month when its market value reached fresh records, crashing through the psychologically-crucial $200bn ceiling for the first time. Not only did this make Toyota the world's tenth most valuable company; it also meant the Japanese giant was worth more than twice as much as General Motors, Ford Motor and DaimlerChrysler combined. "Interest in Toyota is high, and we think there's plenty of upside for the shares," says Deutsche Securities analyst Tsuyoshi Mochimaru.